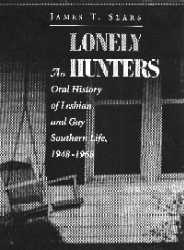 LONELY HUNTERS: AN ORAL HISTORY OF LESBIAN AND GAY SOUTHERN LIFE, 1948-1968, by James T. Sears; WestviewPress; 317 pages, hardback; $28.00. The most important book of 1997 fills a large gap in lesbian and gay studies. As a gay man and a long-time student of history -- I have a B.A. in History, though I did not make history my profession -- I enjoy reading books about the lesbian and gay past. During the last few years we were treated to such books as Gay New York by George Chauncey; Stonewall by Martin Duberman (about the riots in New York City); Boots of Leather, Slippers of Gold by Elizabeth Lapovsky Kennedy and Madeline D. Davis (about Buffalo, New York); Cherry Grove, Fire Island (New York) by Esther Newton; The Gay Metropolis, 1940-1996 (New York City) by Charles Kaiser. What's missing among all of those New York-oriented books are the lesbians and gay men who do not live in New York. As a 35-year resident of South Florida, I looked in vain for histories that talked about gay life in my hometown. It is a sad reflection of this state of affairs that, with the exception of memoirs by Anita Bryant and myself, nothing much has been written about Dade's 1977 referendum, except on how that event affected gays in California and (yes!) New York. Happily for lesbian and gay studies, Southern gay historians have come forward to write about what they know best, the lesbians and gay men who make Dixie their home. Scholars like Professor Fred Fejes of Florida Atlantic University are probing the Southern gay past, teaching our community that there was more to Southern gay life than the KKK and the Christian Coalition, Truman Capote and Tennessee Williams. Gays who only visit the Southland for "Hotlanta", New Orleans's Southern Decadence or South Beach's Winter Party will learn that our region, in spite of its entrenched conservatism (which alas has now spilled over to the rest of the country), is also a society in ferment. What would American music be without Southern jazz, blues, soul and country (and their unruly child, rock 'n' roll), or American literature without Edgar Allan Poe, Mark Twain, William Faulkner, Flannery O'Connor, Tennessee Williams and Zora Neale Hurston? Where would we be without Southern contributions to our labor movement, our civil rights movement, our feminist movement or, yes, our lesbian and gay movement? It is the South's contribution to the struggle for lesbian and gay rights that is at the heart of Lonely Hunters: An Oral History of Lesbian and Gay Southern Life. James T. Sears is uniquely qualified to write Lonely Hunters. An adopted Southerner and professor at the University of South Carolina, Sears is also the author of Growing Up Gay in the South, a first-of-its-kind study of gay Southern life. Covering the years from 1948 to 1968, Lonely Hunters is the first of five volumes that, together, will chronicle gay Southern life in the 20th century, as it was lived by five generations of lesbians and gay men. As the subtitle indicates, Lonely Hunters is an oral history, largely based on interviews with Southern lesbians and gay men. The men and women whose lives make up the narrative range from well-known activists like Richard Inman, Merrill Mushroom and Jack Nichols to Arlen Davies (a pseudonym), "a deeply closeted senior citizen" whose life will form the core of the five-volume series. Some critics might quibble about this combination of biography and history but I think it humanizes the narrative and makes it more interesting to the average reader. On the other hand, Sears's scope is limited by the people he profiled, which explains but does not excuse the fact that five out of seven chapters are about Florida and lesbians are largely absent after the first three chapters. Sears knows his book's limitations, and promises to make up for it in the next volume, which will study the lesbian and gay South from 1968 to 1983 (my generation). The years between 1948 and 1968 were years of ferment in the once-Solid South, lesbians and gay men included. "Reading Lonely Hunters", writes Prof. Sears, "you will dance on the 22nd Street Beach, suffer at the hands of faceless accusers and white angered mobs, descend into the netherworld of hustlers and murderers, learn about corrupt politicians and covert operatives, and experience the transformation from infatuation to love, from man into woman, and from childhood through old age." The seven chapters in Lonely Hunters do not form a unified narrative but can be split into four independent parts. Chapters 1 to 3 is about 1950's Florida, a time of bar raids, Miami's antigay witchhunt and the Charley Johns Committee as experienced by Davies, Mushroom, and Rose Levinson (a pseudonym). Chapter 4, about the Civil Rights Movement in Chapel Hill, is the only chapter that discusses this pivotal moment in Southern history, both from a black (Quinton Baker) and a liberal white (Pat Cusick) perspective. Chapter 5, the story of Charleston's Dawn Langley Hall, is transsexual rather than gay, though it does throw some light on gay society at that time and place. Chapters 6 and 7 brings the story back to Florida, now "the Mississippi of the Homosexual", and how 1960s activists Inman and Nichols pushed the gay cause against a stone wall of bigotry and hatred, eventually to achieve limited success. Though Nichols is a famous and beloved figure in the gay movement, Richard Inman, the father of Florida gay activism, is unjustly unknown to many who now walk in his footsteps. If anything, Sears's account in Lonely Hunters will rescue Inman from decades of obscurity and neglect. Inman disappears from sight after 1969, and I hope that Sears finds or reveals Inman's later whereabouts in future volumes. Professor Sears did extensive research for Lonely Hunters, and it shows in his book's careful attention to facts and events. The men and women who are profiled in this book, while unique individuals, represent all the Southern lesbians, gays, bisexuals and transgendered people who lived and loved, fought and flourished within a backdrop of religious, social and legal bigotry. Their story is our story. Lonely Hunters is a book that needed to be written, and I am glad Jim Sears wrote it. Thanks to Sears, the gay and lesbian South can now boast of a proud history, not as an adjunct to gay New York, Los Angeles or San Francisco, but in its own right.